July 2018: This chapter has been updated throughout as a result of local review and should be re-read. In addition Section 6, Safeguarding and Mental Capacity and Section 7, Information Gathering and Section 8, Principles for Local Decision Making Process are new. 16.1 What happens after an enquiry? An enquiry should establish whether and what action needs to be taken to prevent or stop abuse or neglect. The local authority should aim to provide swift and personalised safeguarding responses, involving the adult in the decision making process as far as possible. For further guidance about cases in which the adult may lack capacity or has a substantial difficulty in being involved, see Mental Capacity. The local authority should record the information received, the views and wishes ascertained, the decisions taken and the reasons for them and any advice and information given. The Care Act 2014 sets out the local authority’s responsibility for adult safeguarding: responsibility to ensure enquiries into cases of abuse and neglect. Local authorities must make enquiries, or cause others to do so, if they reasonably suspect an adult is at risk of, being abused or neglected. taking action / developing a safeguarding plan. The local authority should decide very early on in the process who is the best person / organisation to lead on the enquiry. The local authority retains the responsibility for ensuring that the enquiry is referred to the right place and is acted upon. If the local authority has asked someone else to make enquiries, it is able to challenge the organisation / individual making the enquiry if it considers that the process and / or outcome is unsatisfactory. In exceptional cases, the local authority may undertake an additional enquiry, for example, if the original fails to address significant issues. The information in some referrals may be sufficiently comprehensive that it is clear that immediate risks are being managed, and that the criteria are met for a formal Section 42 enquiry. In other cases some additional information gathering may be needed to fully establish that the three steps are met. Decisions need to take into account all relevant information through a multi-agency approach wherever possible, including the views of the adult taking into consideration mental capacity and consent (see Mental Capacity and Consent in Relation to Safeguarding). The degree of involvement of the local authority will vary from case to case, but as a minimum must involve decision making about how the enquiry will be carried out, oversight of the enquiry, decision making at the conclusion of the enquiry about what actions are required, ensuring data collection is carried out, and quality assurance of the enquiry has been undertaken. This decision on how the enquiry is progressed is made by the relevant team manager. The purpose of the enquiry is to decide whether or not the local authority (or another organisation, or person), should act in order to help and protect the adult. If the local authority decides that another organisation should make the enquiry, for example a care provider, the local authority should be clear about timescales, the need to know the outcomes of the enquiry and what action will follow if this is not done. Although the local authority has the lead role in making enquiries or requesting others to do so, where criminal activity is suspected, early involvement of the police is essential. Police investigations should be coordinated with the local authority who may support other actions, but should always be police led. Wilful neglect usually means that a person has deliberately failed to carry out an act that they knew they had a duty to perform; such acts would be a serious departure from required standards of treatment. The police will determine whether there should be criminal investigations by people in positions of trust where there is ill treatment and wilful neglect. There are a number of possible offences which may apply, including the specific offences mentioned below. The Mental Capacity Act 2005 makes it a specific criminal offence to wilfully ill treat or neglect a person who lacks mental capacity. The Mental Health Act 1983 creates an offence in relation to staff employed in hospitals or mental health nursing homes where there is ill treatment or wilful neglect. The Criminal Justice and Courts Act 2015 relates to offences by care workers and care providers who mistreat persons with capacity in a health or social care setting. Click here to view Section 42 Enquiry Flowchart. Professionals and other staff need to handle safeguarding enquiries in a sensitive and skilled manner to ensure that any potential distress to the adult is minimised. In the majority of cases, unless it is unsafe to do so, each enquiry will start with a conversation with the adult. The relevant team manager should ensure if conversations have already taken place and are sufficient. The adult and / or their advocate should not have to repeat their story. In many cases staff / organisation who already know the adult well may be best placed to lead on the enquiry. They may be a housing worker, a GP or other health worker such as a community nurse or a social worker. While many enquiries will require significant input from a social care practitioner, there will be aspects that should and can be undertaken by other professionals. The adult should be aware at the end of the meeting, what action will be taken and provided with contact details for key people. enable the adult to achieve resolution where possible. Staff need to handle enquiries in a sensitive and skilled way to ensure minimal distress to the adult and where information is already known people should not have to tell their story again. This does not prevent clarification being sought where necessary. There is a skill involved in eliciting information and asking the right questions, to ascertain what the concern is, how it impacts on the adult, what action they would find acceptable and the level of associated risk. Whilst it is essential to put the adult at ease, and to build up a rapport, the objectives of an enquiry should focus the conversation. See also Mental Capacity chapter. 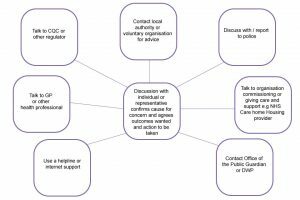 Safeguarding enquiries can potentially involve decision making at a number of different stages of the process. Mental capacity must be assessed when decisions are being made or action taken on behalf of an adult. For information about the test for mental capacity see Section 4, Determining Capacity, Mental Capacity. 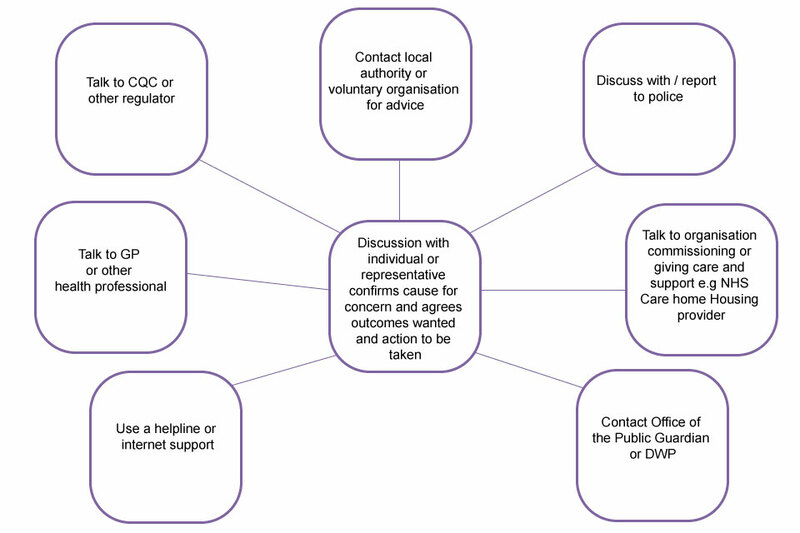 The following is a diagram of who should be consulted when a safeguarding referral has been received (taken from Chapter 14, Care and Support Statutory Guidance, 2016). This should also include the adult’s carer and / or family, where appropriate and where it would not put the adult at any further risk or abuse or neglect. Following information gathering and consultation, if the issue cannot be resolved or the adult remains at risk of abuse or neglect (actual or suspected), the local authority’s duty to enquire (under section 42) continues until it decides what action is necessary to protect the adult and by whom and it can ensure that this action has been taken. Staff should support adults to think in terms of realistic outcomes, but should not restrict or unduly influence the outcome that the adult would like. Outcomes should make a difference to risk, and at the same time satisfy the person’s desire for justice and enhance their wellbeing. The adult’s views, wishes and desired outcomes may change throughout the course of the enquiry process. There should be an ongoing dialogue and conversation with the adult to ensure their views and wishes are gained as the process continues, and enquiries re-planned should the adult change their views. Talking through an enquiry may result in resolving it. If not, the duties under Section 42 continue. If the adult has mental capacity and expresses a clear and informed wish not to pursue the matter further, the local authority should consider whether it is appropriate to end the enquiry. It should consider whether it still has reasonable cause to suspect that the adult is at risk and whether further enquiries are necessary before deciding whether further action should be taken. The adult’s consent is not required to take further steps, where appropriate, but the local authority must bear in mind the importance of respecting the adult’s own views. This decision will be made by the local authority relevant team manager by checking with the adult and consulting with relevant partners and advocate. All enquiries need to be planned and coordinated and key people identified. No agency should undertake an enquiry prior to a planning discussion, unless it is necessary for the protection of the adult or others. Enquiries should be proportionate to the particular situation. The circumstances of each individual case determine the scope and who leads it. Enquiries should be outcome focussed, and best suit the particular circumstances to achieve the outcomes for the adult. There is a statutory duty of cooperation and in most cases there will be an expectation that enquiry will be made as requested. The statutory duty does not apply if cooperation would be incompatible with its own duties, or would have an adverse effect on its own functions. the adult’s own strengths and support networks. It may be helpful to agree the best way to keep the adult and relevant parties informed. Where the enquiry is complicated and requires a number of actions that may be taken by others to support the outcome. It may be appropriate for a round table multi-agency complex panel meeting. Where enquiries are simple single agency enquiries, it may not be necessary to hold a meeting. Action should never be put on hold, due to the logistics of arranging meetings. Proportionality should be the guiding principle. If the adult wishes to participate in meetings with relevant partners, one should be convened. Action however, should not be ‘on hold’ until a meeting can be convened. If the adult does not have the capacity to attend, then an advocate should represent their views. How should the adult be involved? Where is the best place to hold the meeting? Information sharing should be timely, cooperation between organisations to achieve outcomes is essential and action coordinated keeping the safety of the adult as paramount. Information sharing should comply with all legislative requirements. Where one agency is unable to progress matters further, for example a criminal investigation may be completed but not necessarily achieve desired outcomes (e.g. criminal conviction), the local authority in consultation with the adult and others decide if and what further action is needed. The strengths of the adult should always be considered. Mapping out with the adult and identifying their strengths and that of their personal network, may reduce risks sufficiently so that people feel safe without the need to take matters further. support the individual to continue in the risky situation if that is their choice and they have the capacity to make that decision. See Making Safeguarding Personal (Local Government Association) for a range of information. what outcome does the adult want? how can enquiries be assessed as successful in achieving outcomes? what prevention measures need to be in place? Identifying the primary source of risk may assist in deciding what the most appropriate and proportionate response to the individual enquiry might be. There are no hard and fast rules and judgement will need to be made about what type of enquiry and actions are right for each particular situation. There are a number of different types of enquiries. It is important to ensure that where there is more than one enquiry that information is dovetailed to avoid delays, interviewing staff more than once, making people repeat their story. Other processes, including police investigations, can continue alongside the safeguarding adult’s enquiry. Where there are an organisation’s human resources processes to consider, it is important to ensure an open and transparent approach with staff, and that they are provided with the appropriate support, including trade union representation. The remit and authority of organisations need to be clear when considering how different types of investigations might support Section 42 enquiries. Once all actions have been completed a report should be collated and drawn up by the enquiry lead, in consultation with the relevant team manager. In some more complex enquiries, there may be a number of actions taken by other staff that supports the enquiry. Where there are contributions from other agencies / staff, these should be forwarded within agreed formats and time frames, so that there is one comprehensive report that includes all sources of information. who supported the adult and if this is an ongoing requirement. In some enquiries, there will be an investigation, for example a disciplinary investigation; these might be appended to the enquiry report. In drawing up the report, the risk assessment should be reviewed and any safeguarding plan adjusted accordingly. Recommendations should be monitored and taken forward. Agencies are responsible for carrying out the recommendations which might be included in future safeguarding plans. The report should be tested that it meets the standards above, and analysed to assess whether there are gaps, contradictions and that information has been triangulated, i.e. is the report evidence based, and is there sufficient corroboration to draw conclusions. The report and recommendations of the enquiry should be discussed with the adult and or their advocate, who may have a view about whether it has been completed to a satisfactory standard. Overall the relevant team manager will decide if the enquiry is completed to a satisfactory standard. If another organisation has led on the enquiry, the local authority may decide that a further enquiry should be undertaken by the local authority. The exception to this is where there is a criminal investigation and in this case, the local authority should consider if any other enquiry is needed that will not compromise action taken by the police. further action should be taken to protect the adult from abuse or neglect. These decisions are made by the relevant team manager in consultation with the adult and other parties involved in the enquiry. work by contracts managers and CQC to improve care standards. The discussions should help the adult to understand what their options might be and how their wishes might best be achieved. Social workers must be able to set out all options that are open (including action in the civil and criminal courts) as well as other support that might help to promote their wellbeing, such as therapeutic or family work, mediation and conflict resolution, peer or circles of support. In complex domestic circumstances, it may take the adult some time to gain the confidence and self-esteem to protect themselves and take action, and it should be noted that their wishes may change over time. The police, health service and others may need to be involved to help ensure these wishes are realised. a. Fully met; b.Partially met; c. Not met. Do they feel safer as a result of the safeguarding enquiry and protection plan? If the adult does not feel safer at the end of the episode further actions to establish realistic outcomes and protection planning, directed by the adult should continue. The evaluation is that of the adult, and not of other parties. Whilst staff may consider that enquiry and actions already taken have made the adult safe, and that their outcomes were met, the important factor is how actions have impacted on the adult. This should be clarified when assessing the performance of safeguarding. To ensure the safety and wellbeing of other people, it may be necessary to take action against the person / organisation alleged to have caused harm. Where this may involve a prosecution, the police and the Crown Prosecution Service lead sharing information within statutory guidance. disclosures are subject to thresholds of ‘pressing social need’. The ‘pressing social need’ threshold for making a disclosure under common law powers is considered to be the same as that required for the disclosure of non-conviction information by the Disclosure and Barring Service (DBS) . Where it is considered that a referral should be made to the DBS careful consideration should be given to the type of information needed. This is particularly pertinent for people in a position of trust. Where appropriate, employers should report workers to the statutory and other bodies responsible for professional regulation such as the General Medical Council, the Nursing and Midwifery Council and the Health and Care Professions Council. The legal duty to refer to the Disclosure and Barring Service may apply regardless of a referral to other bodies (see Appendix 3, Workforce Development). Where the person is also an adult who has care and support needs, organisations should consider what support and actions may help them not to abuse others. For example, enquiries may indicate that abuse was caused because the adult’s needs were not met and therefore a review of their needs should be made. Where the person alleged to have caused harm is a carer, consideration should be given to whether they are themselves in need of care and support. When considering action for people who abuse, prevention and action to safeguard adults should work in tandem. Adults who have experienced abuse and neglect may need to build up their resilience. This a process whereby people use their own strengths and abilities to overcome what has happened, learn from the experience and have an awareness that may prevent a reoccurrence, or at the least, enable people to recognise the signs and risks of abuse and neglect, and know how and who to contact for help. increasing their communication and problem solving skills. If no further safeguarding action is required and there are alternative ways of supporting adults where they may be needed, then the adult safeguarding process can be closed down. Does the report meet standards? Actions for the person alleged to have caused harm.